Has anyone ever told you that you had a nice voice? Whether you've had professional speaking training or not, you can earn money doing voice-overs. All you need is a clear and pleasant sounding voice. 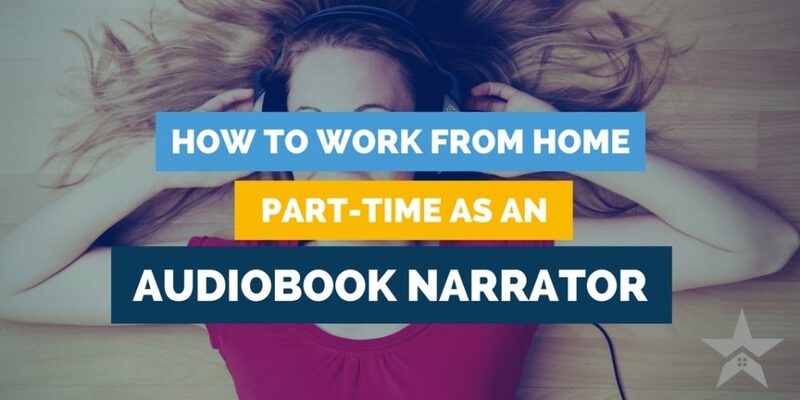 In this post, you'll learn all about earning money by working as a part-time audiobook narrator. Alternatively, you can search for more part time or full time jobs online with FlexJobs. The company has an A+ rating with the Better Business Bureau, along with a money-back policy if you are unhappy with the website. FlexJobs guarantees that every single job is 100% legitimate. What Does an Audiobook Narrator Do? When you think of voiceover acting, you might think of the talented voices behind animated movies and the competitive nature of that industry. This doesn't always have to be the case though. People like you and me can become successful voice over actors. One of the best ways to get started is by narrating audiobooks. Audiobooks have become super popular in recent years. As people get busier and already carry their phones around with them all the time anyway, they are opting to listen to books on their devices instead of reading them. 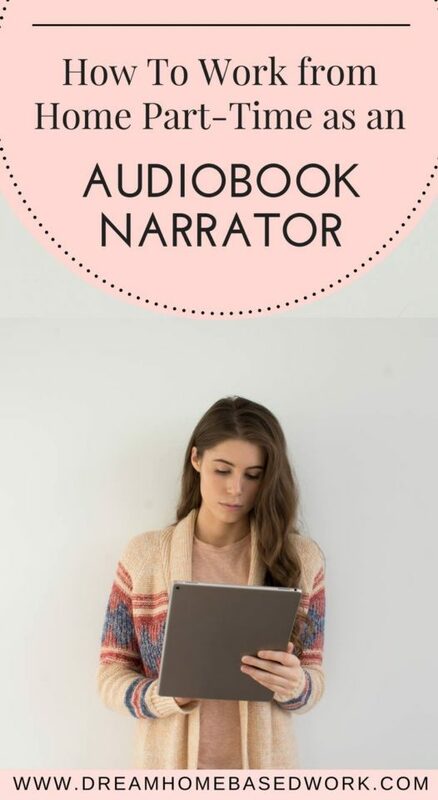 As an audiobook narrator, you'll simply be turning print and digital books into audio files by reading them cover to cover in your attractive voice. I've seen a lot of mixed reviews and thoughts when it comes to measuring the salary of a voice-over actor which is probably due to the fact that gigs and their rates can fluctuate. According to TheArtCareerProject.com and the Bureau of Labor Statistics, voice over actors make can make an average salary of $40,510 per year or roughly $33.82 per hour. Freelance gigs can range anywhere from $20 to hundreds of dollars just for an hour of work. This means if you're persistent, you can earn $20,000/year doing voice-over work and audiobook narration part-time. As a beginner, you my find it easier to start landing freelance gigs to build your experience and boost your portfolio. Sites like Fiverr, Upwork, People Per Hour and Freelancer are all great places to start looking. Upwork has a whole search page dedicated to voice-over narration jobs. As you can see, some jobs range from one-off projects to long-term ones with compensation ranging from $25 – $5,000. You can also consider using some of these sites for job leads. Amazon's Audiobook Creative Exchange (AXC) – This site connects audiobook narrators with books to narrate. When you use the simple search function tool, you’ll find tasks for promotional voice-over roles for businesses generally 5 minutes and under as well as corporate training videos, and tons of audiobooks. There are also additional opportunities to find agents for your talent and earn money as an author and voiceover artist. Voices – This site is an online marketplace for voice talent. Thousands of jobs are added regularly and you can create your own profile on the site then upload your voice oversample. You will do all your managing — updating your profile, uploading new MP3s, reading job postings, submitting auditions — from your computer anytime, anywhere. Voices charges clients a premium rate for their services including narration and you will get paid via check or PayPal. Brilliance Audio – Brilliance Audio is a national leader in independent audiobook publishing. Brilliance Audio was founded in 1984 with a mission to provide a quality listening experience by recording bestselling books and selling them into retail stores at an affordable price. The cool thing about this company is that they actually hire new and experienced audiobook narrators. They encourage new audiobook narrators to take the time to spend 6-7 hours per day reading a book out loud and record their voice to ensure the performance shows acting talent, professional delivery, clear diction, positive energy, and consistency from beginning to end. Learn more about the open positions here. Voicebunny.com – This is a site where you can create a profile to advertise your voice over talent in order to find jobs across a variety of fields including audiobook narration. If so, I recommend checking out FlexJobs. This is a membership site with tons of hand-screened job leads from reputable companies. You can go here and see which Narrator openings FlexJobs has up now. Have you ever thought of becoming an audiobook narrator? Why or why not?